Refusing to let Molly help with the kidnapping investigation, Daniel sends her away to spend the summer with his mother. But even in the quiet, leafy suburbs, Molly’s own pending motherhood makes her unable to ignore these missing children. What she uncovers will lead her on a terrifying journey through all levels of society, putting her life - and that of her baby - in danger. 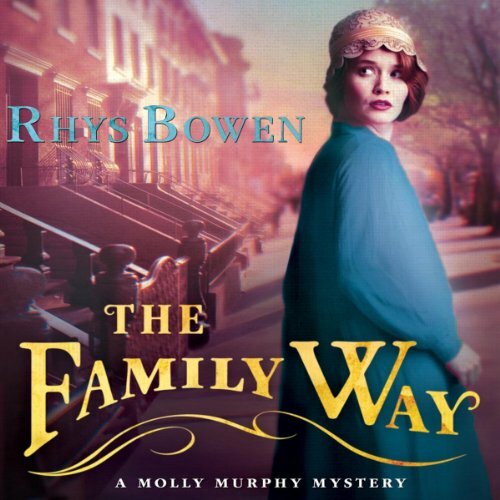 The Family Way, the latest entry in Rhys Bowen’s best-selling Molly Murphy series, will delight fans and win over newcomers with its elegantly plotted mystery, atmospheric historical detail, and vivid characters. ©2013 Rhys Bowen (P)2013 Audible, Inc. I am only halfway through and Molly and Daniel's relationship is driving me into rages. He is acting like an insufferable, tyrannical parent and she is acting like a sneaky pre-teen. She agrees to his controlling ultimatums and then goes out and takes stupid risks. The talk past each other. I don't think "that's how it was then" is a good enough excuse. Shakespeare, Dickens, and Austen, among many others, portray healthy, balanced marital partnerships. Great book, great story but bad noise edits. What did you love best about The Family Way? I enjoy this series. This book seemed to have audible heavy breaths by the reader. Was different. Speaking of heavy breathing...the birth of the baby did not occur in the story but in a "postscript"
You know Molly will get herself into a bad situation, someone will die, Daniel gets mad and it all comes together...Still it is fun to figure out the story connections just before it is obvious! One of the better Molly Murphy stories. The only reason I didn't give it 5 stars is because the editors didn't do as good a job with this book. I could hear the narrator pause, swallow and take deep breaths far too many times. Narration editing on all the previous books was much better. I have liked the rest of the Molly Murphy stories quite a bit. Molly is feisty and smart, and the mysteries are better than those in the Royal Spyness stories. But this one is something of a disappointment. To be more accurate, I have been growing more frustrated with the last few stories, and that frustration came to a head with this one. My main problem is that Daniel no longer seems to have any redeeming qualities. He is domineering and verbally abusive. He keeps her away from what she loves. He doesn't trust her, and shows her little respect in public or in private. And Molly, who started off so strong willed, just goes along with it. She says she loves him, but I don't see any reason to anymore. Being a good kisser isn't enough of a reason, but that seems to be the only thing good about him anymore. My other problem with this audiobook is that it seems like they gave up on the audio editing about halfway through. Barber is a great performer, but suddenly there were audible swallows and breaths and weird pauses. I assume, since I've never heard this kind of thing in other audiobooks, that it is customary to edit these sounds out. There was no problem at the beginning of this story, but then they started, and by the end, it was quite distracting. Would you try another book from Rhys Bowen and/or Nicola Barber? Yes, the Royal Spyness series is better overall. Has The Family Way turned you off from other books in this genre? No but it made me regret starting this series. She was great and I like her accents. I don't know how accurate they are but her delivery is good. Based on the sample reading, I started this series instead of Royal Spyness and I wished I had stopped at the 3rd book in this series. I was thinking she would stay independent, headstrong, and witty. Instead of pretending to be submissive to appease her husband, I think she becomes submissive with each book. I also find Molly's relationship with Daniel a bit unhealthy/abusive. In the end, the amazing coincidences, the lack of common sense, and icky love story has made me stop with this series. However, I am so glad that I started Royal Spyness because I think Ms. Bowen can create great characters. I love all of her books, the narration was on point as always but I think they could have done a better job editing it. I could hear when she would take a breath and swallow in certain parts and it was really distracting. Overall a good read! She does not disappoint! Not my favorite, took a very long time for the storyline to get going. This is the first book in series that the performance was poorly recorded. There were many times you could hear the narrator taking a deep breath or turning pages. It was distracting. Did no one edit this performance?!? As always, an enjoyable “read” from Rhys Bowen. I think Nicola Barber is an excellent narrator but about halfway thru the book til the end, it’s as if you can hear the poor woman swallowing or taking a drink. Did anyone who does editing listen to this before releasing it?? It gets very distracting and annoying. Too bad.